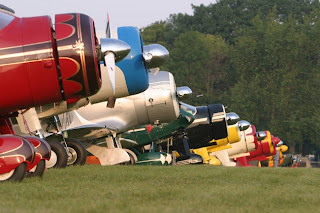 Several years ago Ginger and I drove to Oshkosh instead of flying. Beginning as transportation to an event, it ended up a journey of self-discovery. When all was said and done, I would never be the same. Most dictionaries define the word participation as, "the act of taking part or sharing in something". It is a meaning understood and accepted by most. Society though sees it as more. To participate is to accept those around you. Therefore if you don’t participate you are seen as an outcast or anti-social. This is unfortunate. Arriving at Oshkosh properly packed and equipped with unlimited transportation makes the occasion so much more dignified. Washing your clothes in the shower is a thing of the past. Compared to some old 1927 stringbag, any vehicle, even a Smart Car, carries more socks. It’s one of the reasons regulars often have a presence in Camp Scholler. Naturally, once a person has attended the event by air for several years, the car begins to look good. And to most it is. For me not so much. The problem lies in the definition of participation. Today, as with the trophy given in its name, it is something so broadly defined everyone can claim it. And yes, I realize some could read that and see it as condescending but it’s not. It’s merely an expression of what makes me tick. Auto racing fascinates me but I see no reason to go to a race. If I’m not driving a car, there is no interest inside. Most people though who claim a love of automobiles love going to races. Baseball? Yeah it’s fun but if I’m not swinging the bat or throwing the ball why would I watch others do it? And yet, most people I know love going to the occasional ballgame. Likewise, aviation may be my passion but events are of little interest to me unless I am putting them on or helping to put them on. More importantly, if I’m not flying a plane, why would I go watch others do so? It is the one thing about people I’ve never understood. Despite that, in the interest of fitting society’s definition of “social”, I tried. That was at the root of my great personal revelation; Never waste time doing anything you truly don’t want to do. Being somewhere is not participating to me, it is attending. Therefore, driving to Oshkosh instead of flying is attending, not participating. And attending is of no interest to me. Therefore I should not want to waste my time in Wisconsin. Why then am I so excited to drive to Oshkosh? I will be participating in friendship. After two years away, I miss you guys. I started driving to Oshkosh a couple of years ago. Why? Because as I approached 70 years of age I just can't walk all day, and all evening too. I simply need the car to get around. But does that turn me into an attendee rather than a participant? I think not! During the week I will make 5 forum presentations, work 16 hours in the booths of 2 different exhibitors, and attend several meetings and dinners. I'm pretty sure I'm a participant. Yes you certainly are. I can’t spell out every possible combination of ways every person participates but thought I made may point there are other ways to do so. I only get two days at Oshkosh yes driving have to be back to work on Friday ! But yes I will be there and make the best of it life is about the people . Wow, Rich! Never seen that side of you! Don't know how to describe that attitude! 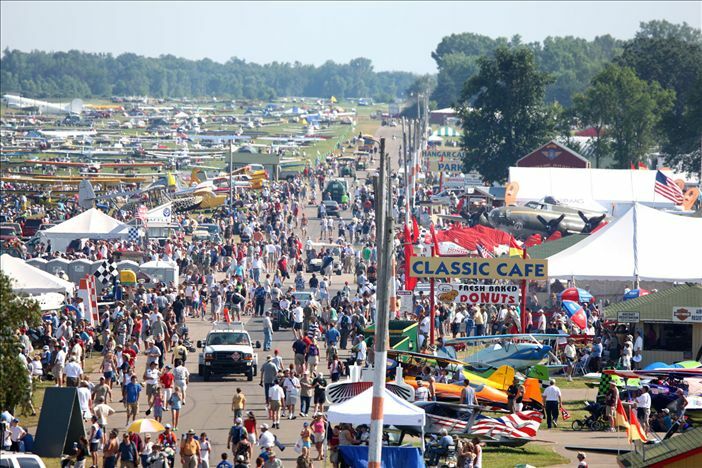 My first Oshkosh trip was in '66, when it was still Rockford. Since then, I have made 42 "attendances", all on the ground. However, I have always been a participant!! Back when I was still employed by the Federation To Abolish Airplanes, I regularly put on SRO seminars at the FAA building, '90 thru '08. Also did about 60 hours at the NAFI booth, and regularly hopped on one of those little scooters to do Flight Line Safety patrol duties. So, I'm a mere Attendee 'cuz I didn't FLY in?!?! A little sour grapes there ol' buddy! Well, it appears Les got it. To make it easier for everyone to understand I changed two words. Funny, I even knew people would try to take it wrong and so I even wrote it in there. But apparently that didn't help. The way I see it is the way I see it. You don't have to see it that way. Some people like to watch others. I do not. I think their trying to say your full of it Rich, but I've know that for a long time about you, buddy. lol. Hey Bill, how are you doing? It's been a while. I hope you and the family are well. As for being full of it. Nope, people get bent out of shape over the little things and don't seem to care about the big ones. That's life. Take care. I've only been to OSH nine or ten times, so I am a piker compared to others who have posted. After the first two times I attended, I volunteered with the Warbirds. The participation of being a volunteer was what kept me coming back, that and the fact that I was actively flying. My last attendance was just before I gave up on keeping my medical and 90 day requirements current because my job keeps me bouncing from one state to another and I do not own an aircraft of my own, but have to rent. So, I'm with Rich in that if I am not actively participating, there seems no point in my attending. And, if I am not actively involved in the sport/activity I am no longer participating. Paul Champion here, one of your former Chautauqua Flight Attendants. As always, I enjoy your postings, and I sure can concur with your statement that: "Some people get bent out of shape over the little things and don't seem to care about the big ones." How true that is. 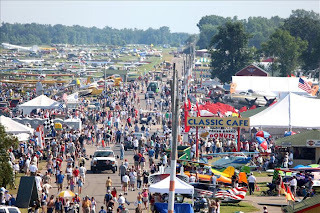 I believe that I've been to Oshkosh three times, all way back when I was still current, flying and/or working on my Champ, but I never was able to fly there in the poor, slow, rickety old thing, so I always had to make like a "groundling" and camp, or get a room in Ripon, and take the shuttle in every day. And while I really loved and enjoyed my time there, (who amongst us that loves airplanes wouldn't?) I was just another wide eyed, wrist band, bracelet wearing attendee. Which at that time and place in my life and in Aviation, was okay. But like yourself, I love cars, and I love to drive fast, (just ask Derek Bell about the time he and I took turns driving my 06 Mustang GT around the "Ville one night after getting back from a trip!!) but I don't have the slightest interest whatsoever in attending NASCAR. I don't even watch it, and I reside in TN where it's virtually a religion. People that know I'm a Musician and love music are always asking why I didn't go to concerts, and I always tell them the same thing: "I have no interest whatsoever in being crushed by a hoard of sweaty people screaming at some specks on a stage a quarter of a mile away". Even if I'm front row center, it's no fun for me because I just sit there and analyze every note and missed lyric. The stage is/was my element, but I'm only content when I am upon it, not looking up at it. So I get your drift. So sorry to hear that the Fly-In is kaput this year, but pleased to see that you are still in business there anyway. Please say hello to all of my flying friends there in SDF, give my best to Ginger, and enjoy Oshkosh!!! Paul Champion is a former Flight Attendant for Republic/Chautauqua Airlines and resides near Nashville TN. I made two trips to Oshkosh. The first in 1977. The second in 2010. I liked the first one, and almost - almost hated the second. In the first one, I could afford to fly. In the second, I could hardly afford to drive (the "flash flooding" didn't help much either. Also, it seems to me that most established maintenance shops have dramatically increased their prices. The most expensive Annual on my Cessna 120 was $850. The cheapest Annual on the Cessna 150 was $2,100; with the 120 in SOCAL, and the 150 in Oregon. The time difference was less than two years ... go figure. It has become cost-prohibitive for me to fly GA; therefore, I have "self-demoted" to the ranks of Ultralight / LSA genre. The costs of owning a QCU Challenger II is way more in line with what I can afford. To get back "on topic", I would agree that the 2010 Convention was a well-attended event for me, and felt more like a part (as in "PARTicipate")of the '77 Convention, when it was all about the flying, and not all about the money (imo). 36 years can also change the motivation and attitude of a person (as well as their bank accounts). So non pilots cannot participate in the EAA experience? You have been instructed beyond your intelligence. That's nice. Did you even read it? How about reading the post "Don't Be Yourself..." next? That would be a good second read for you.